Contact us by e-mail or call us at (408) 528-0821. 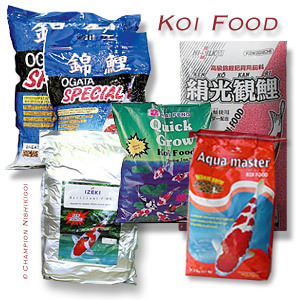 We welcome all your comments and suggestion about koi or this web site. We are located in San Jose, California. Click here for directions. When placing an order by phone or email please provide us the ID number for the koi. Prices are subject to change without notice and may be different at our store. Order can be done by online, phone, fax, or email. We accept Visa, MC, Discover, American Express, or money orders. No COD's Accepted. California residents add sales tax. Most product orders will be shipped the next business day unless it follows on the weekend or holiday.All shipments are generally sent by UPS ground shipping which is most economical. Fish will be shipped via Delta Dash Air cargo, SouthWest Air Cargo, FedEx Overnight, or equivalent service. Supplies are shipped via UPS ground unless customer request differently. All orders must be prepaid by credit card. SORRY BUT NO RETURN OR REFUND ON FISH. All fish are sold as is and final. We only guarantee live arrival and you must be present at the time of delivery to accept the fish and sign for it. If the fish died upon delivery we will replace it with another fish of equal value. You must notify us immediately by email, phone, or fax, within the first hour of delivery in the unfortunate event that the fish died when you received it. A digital picture of the dead fish must be taken and email to champkoi@champkoi.com as proof . We cannot accept responsibility for shipping delay or damages done by the carrier. Other non-returnable include chemicals, medications, water conditioners, and pond liners. The original purchaser has a period of 14 days to return an item and subject to a restocking fee of 15%. NO refund on any shipping and handling costs. Special order items, sales or special deals are also not returnable. The merchandise must be in resalable UNUSED condition and returned in the original undamaged packaging. All warranty books, instructions manuals, parts and accessories must be included as well as the original box in which the item was shipped. To protect the original factory carton from any additional shipping damage, please place it inside another carton for return shipping. A Return Goods Authorization number (RGA) must be obtained prior to shipping any item(s) back by contacting Champion Nishikigoi (you will need to have your invoice handy). Acceptance of merchandise is final only after inspection. Customer is responsible for return freight to us as well as the original freight costs except for defective and items shipped in error by Champion Nishikigoi. Note: on orders sent with free freight, customer will be responsible for actual outgoing freight charge. IMPORTANT - Inspect all packages, especially fish, BEFORE YOU SIGN. Note on the delivery receipt any obvious damage or notify the driver if present at the time of delivery. Failure to do so will result in you being liable for the damaged merchandise. Call UPS immediately at 1-800-742-5877 to file a damage claim upon delivery of any noticeable damage. We cannot assist you in working out a settlement with UPS unless they are immediately notified of the damage ... and we are unable to accept responsibility for damage if the goods have been signed for and accepted in "Good Condition". If you suspect internal damage OPEN IMMEDIATELY! Even if no damaged goods are suspected, open the carton(s) within 24 hours and make a thorough inspection. Hold all damaged goods and their packaging materials for inspection by UPS and call them at 1-800-742-5877 to file a damage claim. In the event a customer refuses delivery after the merchandise has shipped from the factory, the customer will be responsible for all UPS charges to and from the shipping location and a restocking fee. In the event a customer cancels an order after the merchandise has shipped from the factory, the customer will be responsible for all UPS charges to and from the shipping location and a restocking fee. Note: If the customer returns the item(s) for any reason except that it is defective, customer is responsible for outgoing UPS charges as well as return UPS charges. 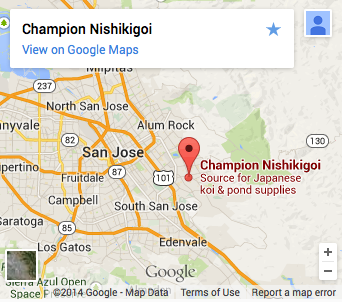 Champion Nishikigoi does not warranty any product sold in this catalog. All warranties are provided by the original manufacturer. Products returned for warranty consideration must be sent to manufacturer for their evaluation and final disposition. A RGA number must be obtained before sending in a warranty claim. Champion Nishikigoi shall not be responsible for any damage caused by shipping delays, use of products, errors in shipping, or damage to personnel, lost income and damage caused by the installation of said products. Koi are placed in large size, doubled, heavy-duty bags filled with water and pure oxygen. Styrofoam insulation, along with ice pack will be used when needed. All Koi are shipped in heavy duty cardboard boxes used for shipping live koi. We try to check our mail daily and welcome all comments about this website or questions relating to Koi, please write by clicking the Email address.